Golden and lightly crisped, these twice-baked cranberry pistachio biscotti are perfect for Christmas. A recipe from CPR celebrity, Mike Lamp. 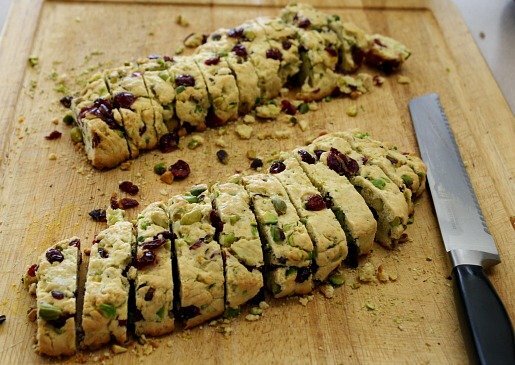 Classic Cranberry Pistachio Biscotti. Our friend Mike makes the best. 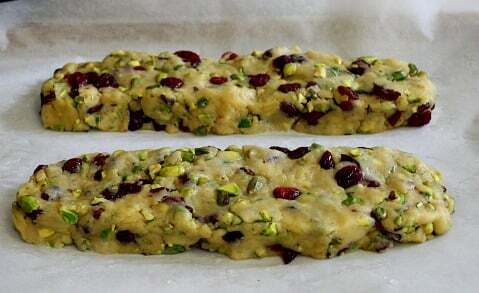 A slight variance from a traditional Italian Biscotti recipe, Cranberries and Pistachios add a festive holiday version. We met Mike Lamp through our mutual friends, Greg and Cauleen and got to know him at gatherings at their house. Gatherings like the annual New Year’s Day pork and sauerkraut celebration, the Halloween night chicken pot pie event, and the annual Easter egg hunt and ham extravaganza. All of us invited bring something to add to the meal, and it’s always a treat to see what Mike brings. He has a knack of picking something impressive and creative which he crafts perfectly leading all of us to quickly gather round the platter for the traditional viewing and the culinary explanation behind his creation. I rest my case with this photo of his swoon-worthy chocolate dipped candied orange peel that he brought one holiday. And this past January he showed up with a container of homemade biscotti. Loaded with dried cranberries and pistachios and spiked with the zest of an orange and almond extract, it was hands down the best biscotti I’ve ever tasted. Let’s take a look. Biscotti is a fairly uncomplicated project, combining flour and butter, fruit and nuts and shaping into logs before baking. Biscotti gets it’s signature texture from a double bake. After they come out of the oven, use a serrated knife and slice on the diagional. Lay the pieces flat and pop them back into the oven for a 2nd bake. Cool biscotti on a wire rack and then store in air tight containers for two weeks worth of treats to enjoy with your morning coffee. This recipe was easy enough for even me the non-baker to make. Thanks for tip on a great recipe Mike. This photo comes from the CPR web site. 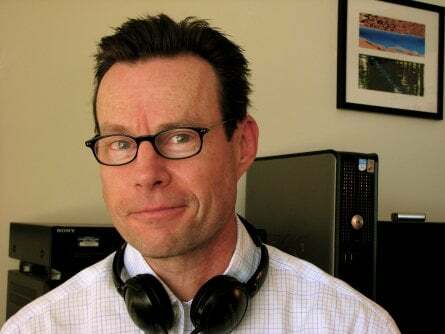 Mike Lamp is an award winning journalist and currently the morning host of Colorado Public Radio’s news service. He produces interviews heard on “Morning Edition” and “All Things Considered”. 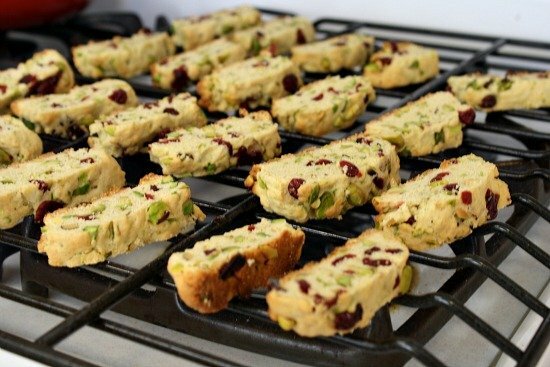 Golden and lightly crisped, these twice-baked cranberry pistachio biscotti are perfect for Christmas. Position rack in middle of oven and preheat to 350 degrees. Line a rimless baking sheet with parchment paper. In bowl, sift together flour, baking powder and salt. Set aside. By mixer, in a large bowl, combine the eggs and sugar. Beat on medium speed until light in color and thick, about 3 minutes. Beat in melted butter, orange zest, vanilla and almond extract on low speed until blended. Add the dry ingredients and mix until well incorporated. Using a wooden spoon, stir in pistachios and cranberries. The dough will be soft and sticky. Scoop half of the dough onto 1/2 of the prepared baking sheet and form it into a log 10 inches long. Repeat with the remaining dough, and space the logs about 3 inches apart. Press the logs gently to make them 3 inches wide. With damp fingertips, gently smooth the surface of the logs. Bake the logs until they are crisp and golden on the outside. 20 - 25 minutes. The centers will be soft. Remove from oven and lower oven temperature to 300. Let the logs cool on the baking sheet for 10 minutes. With a wide spatula, transfer the logs to a cutting board. Using a serrated knife cut the logs crosswise on a diagonal into slices 3/4 inch thick. Arrange the slices cut side down and 1/2 inch apart on the baking sheet. Return to the oven and bake until cookies are crisp and brown on the outside, about 17 - 22 minutes. Let the cookies cool on the baking sheet for 5 minutes, then transfer to a wire rack to cool completely. The interior of the cookies will become crisp as they cool. Store in an airtight container at room temperature for 2 weeks. This looks good enough to serve for a birthday!! Bet it travels well…you know…like if you wanted to send it to a friend or something. I don’t believe I’ve ever had biscotti, but this sure makes me want to. I don’t like most biscotti. Hard and crunchy isn’t my idea of a treat. But both recipes that I’ve made myself have been good. What a pretty looking treat. I’ve never made biscotti although I have threatened to many times. This recipe just might be inspiration I need to get with it. I’ve made biscotti twice and have liked the results from both recipes. You know it’s easy if I can make it. This is a wonderful combination. I think I will make a batch when we have company. On second thought, why wait for company? I agree Penny, why wait. Actually it makes a pretty large batch. You could freeze some of it. Love everything about this including it’s so much prettier than the usual biscotti. A must try for sure! I haven’t made biscotti in a long time but I do remember that I was very impressed with how easy it was and how well it turned out. Yes, it is easy. You know if I can make it ….. I just made biscotti today too since our family is coming over this weekend and my SIL loves biscotti and a little Vin Santo for his dessert after dinner. I make a very traditional Italian version with almonds but I would love to try this fruit and pistachio-studded version. It’s beautiful too! I’ve sure been noticing biscotti recipes since I made this batch. So many good versions. 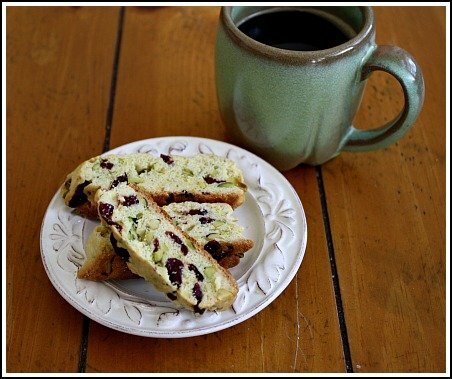 I have a favorite cranberry & walnut biscotti. I’ll have to give this recipe a try to see if it beats it 😉 I always think W-S recipes sound so good! Cranberry/walnut has caught my attention. I’ll have to try that combo. How lucky to have such a wonderful friend. That candied orange with dipped chocolate makes me drool, and have a biscotti fanatic friend who’ll love this recipe. Aren’t those orange slices impressive??? I loved them. Absolutely wonderful, Lea Ann. I’m saving this for the holidays. WS has fab recipes, I adore their Butternut Squash soup recipe…use it every Thanksgiving. I love biscotti…no matter how full I am after a meal, I always have room for one or two. These sound great…thank Mike for sharing the recipe with us. I’m not a big biscotti lover, but I sure couldn’t keep out of these. I’ve never made biscotti before, but you make it sound so easy. The recipe makes me sad because I lost the handwritten copy of the first BBQ sauce I ever had that my deceased grandmother gave me. It is somewhere in this house on a 3 x 5 notecard. I know the recipe but I want the handwritten one. Biscotti is pretty easy. I sure hope that recipe turns up Chris. I hate loosing things like that. I am so impressed with this one – such a beautiful treat! You can bet I’ll be making these next time my kids come for a visit. Gorgeous photos! Biscotti is pretty darn easy. This made a pretty big batch, so I have some in the freezer. 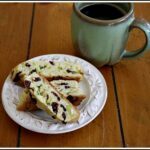 I love Biscotti- I’m going to have to give this a try!!! I can’t bake, but for some reason I can make biscotti. I hope you like it Robyn. What a perfect cookie for Christmas saving this one.. if I get a chance to make it I will blog about it with Mike and you very nice recipe! Thanks Claudia! It’s a flavorful recipe. I just had to make it as soon as I tasted what Mike brought to the party. Thanks for stopping by and the comment.